You sleep one-third of your life away. When put into perspective, you’ll sleep for four full months this year. And since you can’t sustain a normal lifestyle without sleeping, it’s important that you make all of the hours you sleep count. A bad night’s sleep can leave you feeling fatigued, angry, and with aches from your neck to your back and even your legs. There is a lot to consider when buying a queen mattress, and one of those considerations is price. We’re going to be discussing how you can find a high-quality queen mattress for under $400, and what you should be looking for to ensure that the mattress you purchase is right for you. Airflow: Many of the mattresses listed offer airflow layers. When sleeping, mattresses without airflow layers trap heat, causing people to sweat at night. If you’re the type of person that wakes up in a sweat, an airflow mattress is ideal. Thickness: A personal preference. The bottom layer of many of these mattresses is thick to provide base support. The industry standard thickness for a queen mattress is at least 12” thick. Firmness: Memory foam models offer comfort and firmness. The right firmness for you depends on the sleep style you prefer. A higher firmness will keep the spin aligned, but will add to pressure felt when sleeping. Keep these tips in mind when reviewing the mattresses below – we did when making our selection. Sleep Master Ultima® Comfort 12 Inch Euro Box – The Ultima is one of the industry’s best kept secrets. Offering 12” thickness, this model has iCoil pocketed springs with a foam and fiber cover to maximize comfort. Hybrid in style, this mattress comes in a box and can be unrolled easily. The mattress coil density was not listed. 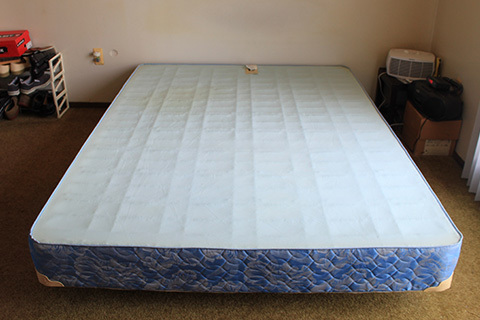 Small and easy to use, the mattress will fully expand in 24 hours and can be placed on the bed without any help. Contouring to your body, the foam allows for pressure relief when you sleep, and promotes proper sleeping posture to keep your neck and back in proper alignment while you sleep. Solid, comfortable and well-built, this is the right mattress for any queen bed. And it offers a value you’ll find only at the high-end price range. Classic Brands Cool Gel 12 Inch Gel Memory Foam – Comfort meets affordability with Classic Brands. This memory foam and gel mattress is like sleeping on a cloud, and it’s 12 inches thick, allowing for proper weight distribution when you sleep. Two gel-supported foam layers allow for proper airflow – goodbye night sweets – and the promotion of cooling, so you’re always comfortable when you sleep. Memory foam conforms to your body, and a 25-year warranty protects your investment. Surprisingly firm for a memory foam / gel mattress, this is the right choice for anyone in hotter climates or that wake up sweating at night. And there are no odd smells from the memory foam as experienced with other mattresses. Sleep Master Ultima® Comfort Memory – Another Ultima mattress that is 12” thick, but has a different composition. This comfort memory foam mattress doesn’t include coils. Instead, it’s comprised of three unique layers of foam that make the Ultima soft, comfortable and supportive. 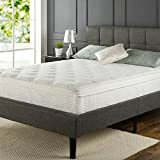 The top layer offers 3” of memory foam followed by the mid-layer which offers 3” of pressure-relieving foam, and the base which is 6” of support foam. All of these layers combine to offer a great night of sleep, and BioFoam is used to offer natural plant oil instead of petroleum oil to provide a better overall “smell” of the mattress. This is the right choice for you if you want a high-end memory foam mattress at a low-end price. Signature Sleep Memoir 12-Inch Memory Foam Mattress – Signature Sleep’s Memoir is affordably priced, and this mattress is another memory foam model. Offering 12” of thickness, this mattress has just two layers of foam – unlike the previous model reviewed. The top layer consists of 3.5” of memory foam, while the bottom layer, 8.5” in total, is made up of high-density foam. Comfort is offered thanks to the top layer of foam, and this mattress fits queen-sized beds while also being comfortable and conforming to the body. The cover offers breathability, too, so that you’re comfortable all night long. We recommend this mattress for anyone on a tight budget. Zinus Memory Foam Green Tea Mattress – The Zinus is the one of the most affordable memory foam mattress on our list, and it offers one of the best combinations of memory foam. This mattress is 12” thick with 3” of memory foam, 2” comfort foam, 3.5” support foam at the bottom, and 3.5” of airflow foam. What we really like about this mattress is that the airflow foam really does keep you cool. If you’re the type of person that sweats at night or has hot flashes, you’ll find hat this mattress offers a superb night’s sleep. Natural green tea extract is also infused into the memory foam to guarantee freshness – something unique in the industry. With comfort and support, this is a great mattress for all sleeper types. If you like the look of the Zinus mattress you may be interested in our in depth comparison of Signature Sleep and Zinus mattresses. You’re looking for the best mattress you can afford, and you don’t have thousands to spend on high-end models. Most people want to find the perfect balance between affordability and comfort, and the $400 and under mark seems to be the sweet spot for many budgets. Thickness: A thickness of 12” is fine for most sleepers. If a person is heavier and still wants a “bounce,” a higher thickness level will be the ideal choice. Firm Base: When you sit down, do you want a bed that sinks, or one that doesn’t have much spring to it? Memory foam is the ideal option if you don’t like too much “sink” as it doesn’t normally sink beyond the top layer of foam. Sleep Style: The way you sleep puts pressure on different areas of the body. Side sleepers suffer from pressure pains, and cushy memory foam (or a thicker topper) alleviates much of this pressure. Back sleepers need support to keep the spine aligned, and all bed types will suffice given the right firmness. Stomach sleepers, on the other hand, want enveloping memory foam. Many people can’t pinpoint the right mattress for them. Memory foam and hybrid options seem to work best for most people as they provide the right balance between comfort and conformity. Hybrid models, such as those with springs and memory foam, are the right choice if you’re undecided and want the perfect balance of comfort, support and bounce. This entry was posted on May 18, 2016 by Carrie Gutierrez.